The ground is breaking in New Orleans, and it’s giving the Lower 9th Ward a reason to celebrate. Thanks to the effort and celebrity backing of a familiar face on Inhabitat, Brad Pitt’s Make it Right (MIR) initiative recently began construction on several homes! 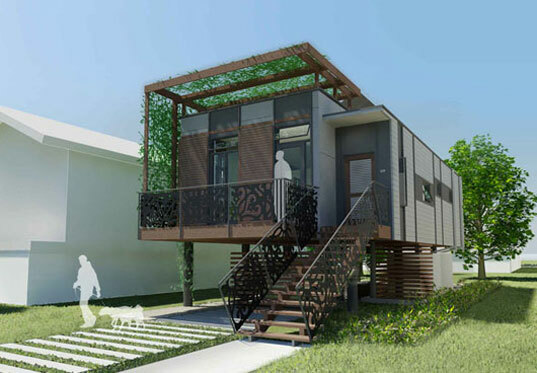 Contributing to the rebuilding effort following the devastation of Hurricane Katrina, the Make it Right campaign set a goal of constructing 150 new residences designed by 13 different local, national and international architectural firms. While each design is unique, all the homes are employing sustainable building strategies while taking into consideration the ease of fabrication through replication. Each home is designed to be built within a budget of $150,000, which has been collected primarily by donations pledged through their website. Make it Right is committed to working hand-in-hand with New Orleans communities to help rebuild their neighborhoods. The organization convenes with local groups to select residents in need who then select their future home from one of 13 designs. Of these designs, three houses have begun construction thus far, including Inhabitat regulars Kieran Timberlake Associates ’ Garden Prototype, a house by international architecture firm GRAFT, and Concordia Architect’s Lagnaippe House. Featured above, Kieran Timberlake’s Garden Prototype stick-built home is somewhat reminiscent of their acclaimed Loblolly House. A flexible system allows for a variety of customization opportunities for potential owners while opening-up the possibility of off-site prefabricated and assembled systems. Hello Brad....nice to meet you. I don't know if you are still in New Orleans or not. (?) I had been tracking the Hurricane as with so many others as well. I don't know how bad the damage was, but I'm sure any offered help would be taken. Just email me back and let me know. I'm sure we could spare some for the ones torn apart. You have a good day, hear? Lorri Angeline Nichols, CIA, USA. GOD BLESS YOU ALL My mother is Ms. Melba, of 1744 Tennessee Street, lower 9th ward, and she lost more than just a home in 2005. Both her mother and father passed away just before this unreal occurrence happened. And she never had the chance to grieve. This is the first time I’ve seen her smile in a long time. I thank Mr. Pitt and his family and the Make it Right foundation for this opportunity for a new start at life. I want to say “thank you” to all who have done anything and everything that God has put on your hearts to do, for my family. When I see the new homes, I want to cry tears of joy, but also sadness since it feels as though all pieces of me have gone. Thanks to this project for putting my 9th ward family back together. Love Always The Vann Family (Barbara, Jimmy, Cheyenne, and Yurrianne) of North Carolina C/O Mr. and Ms. Barnes, 1744 Tennessee St.
Have some of you BEEN to New Orleans? The Garden House is very typical of a shotgun-style house found throughout the city. I don't understand why the houses have to look so strange. I'm sure houses can be sustainable and still look normal. They don't fit in with the Lower Ninth at all, though I guess after they build 150 of them, it will be the houses already in the L9 that will look out of place. Great concept but a little more intense than necessary. Make it Wrong? Make it Ugly? Make it a trailer on stilts? Wow.... The model for the Lagnaippe House showed promise, but the built form is.... Well... It looks like the roof is falling in. Hurricane Style? The Graft House looks like part of it got torn off in a hurricane... Not Good. And the Garden Prototype... I've seen better looking double-wides... (seriously)... All for a bargain $150K each ? This is embarrassing. The Graft House is staggeringly ugly. The ground is breaking in New Orleans, and it's giving the Lower 9th Ward a reason to celebrate. Thanks to the effort and celebrity backing of a familiar face on Inhabitat, Brad Pitt’s Make it Right (MIR) initiative recently began construction on several homes! 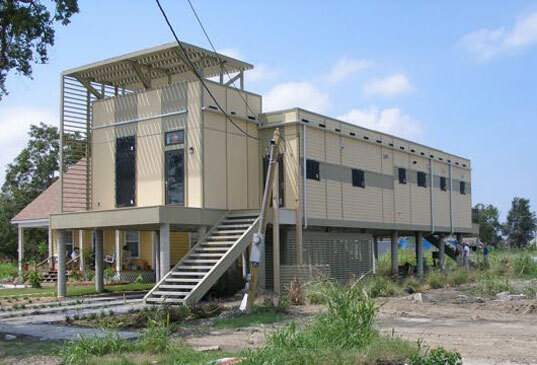 Contributing to the rebuilding effort following the devastation of Hurricane Katrina, the Make it Right campaign set a goal of constructing 150 new residences designed by 13 different local, national and international architectural firms. While each design is unique, all the homes are employing sustainable building strategies while taking into consideration the ease of fabrication through replication. Each home is designed to be built within a budget of $150,000, which has been collected primarily by donations pledged through their website.